Peru for You: Lets go to Sunny side. Lets go to Sunny side. Holler. My friend Jake just showed me this picture. 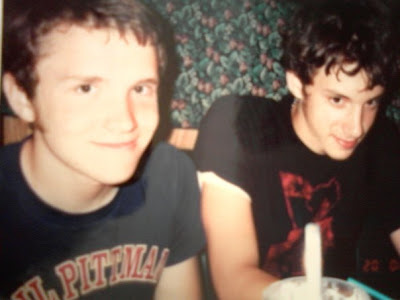 Its from probably 4-5 years ago after one of the first Daphne Shows.... SHARIS! SOOO good. I am almost positive that we just got done playing Club Impact. Those days were great. I miss Jake, Stu, and all the guys. Was anyone here at this show? 2008... what happened. We are almost have the way done. Any thoughts? Does anyone have any old pictures or memories they want to share? THE jase shirt. forever. my notes say this is hopeless love from the el rey in june 2005.
the good ol' days. from the same show. this has always been a good memory to me and my friends because from the angle it looks like spence is proposing. glasshouse october 2005.
i'm going to be all over this post soon hahah i have some great pictures to share! and OMG I CAN SEE MYSELF IN THAT LAST PICTURE CHRIS POSTED HAHAHAH!! lol i can see my ugly outfit in that last picture chris posted too. hi jason!